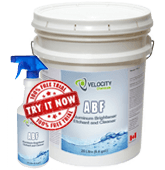 ABF is a heavy-duty aluminum brightener that can be used to remove road film, rust, oxides, light oils and greases. Leaves a satin finish after cleaning. It is used by trucking companies, aluminum and plastic manufacturers, for exterior cleaning of aluminum trucks and trailers, and other types of aluminum. It can also be used on painted surfaces for a 2 step truck and trailer washing system in conjunction with an alkaline cleaner. Apply ABF with a low-pressure spray at a concentration from 25:1 to full strength, depending on surface soil conditions and temperature (use higher concentrations at lower temperatures). Contact time is up to 10 minutes, depending on the end use concentration, soil conditions and temperature. For trucks and trailers, apply horizontally from the bottom up, and then rinse vertically from the top down to avoid streaking. Pail and Brush – apply as above. Immersion (plastic tanks only) – use at 10% to 20% dilution. Immerse for 5 to 20 minutes. Rinse well with water. 2 Step truck and trailer wash: pre-spray at 2-4%. For short contact times, ABF can be safely be used on glass. Allow to stand for a few minutes before applying an alkaline cleaner (i.e. MOBIUS, COMMANDO). Then, pressure wash with preferably hot water. ABF will etch glass and polished aluminum, leaving a satin or hazy finish on both surfaces. Please refer to Material Safety Data Sheet for disposal and handling procedures.